Studebaker president Sherwood Egbert and chief engineer Gene Hardig agreed that the Avanti body should be built of fiberglass. The fiberglass body, with its relatively low rigidity, would work well with the Lark convertible X-frame that had been chosen for the Avanti chassis. This glass fiber-reinforced plastic body was made by the Molded Fiber Glass Body Company of Ashtabula, Ohio. The cost for each body would be greater with fiberglass, but tooling costs would be less. The first Avanti body was delivered in just over ten months and tooling costs were less than one million dollars. In steel, the same results would have required 15 months and an estimated $17 to $20 million. Fiberglass was also dictated by the production schedule of 1,000 units per month, substantially below the 1,700 to 2,000 units considered economical for steel. An Avanti body, as delivered from MFG, was made up of 100 molded parts and 36 pieces punched or sheared from a fiberglass sheet (Avanti Fiberglass Body Parts Diagram). MFG assembled, finished, and painted Avanti bodies for Studebaker and also shipped parts that Studebaker assembled into bodies in their own plant. Body glass thickness for the Avanti varies according to requirements but the average panel is .100-inch thick. The completed body weighs 510 pounds, 355 of which are fiberglass parts that are molded and/or riveted into the body to give reinforcing or tapping plates for parts attachments. The 100% fiber glass body of the Studebaker Avanti produced by Molded Fiber Glass Body Company. 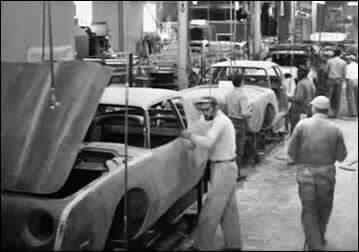 The Avanti fiberglass body on the assembly line. 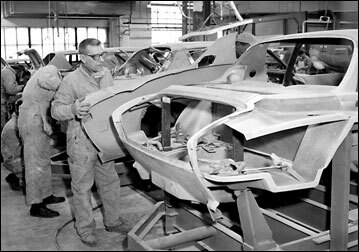 A fiberglass body being assembled at the plant.